In the Walpole Nornalup NP near Walpole and Denmark, WA. The Ancient Empires Walk takes you through the forest at the base of the Giant Tingle Trees. Combined with the Treetop Walk, it is one of the most visited place on the coast. Waking into the great canopy of the gaint tingle trees is an experience not to miss. A well paved, wide pathway winds along from the Treetop Walk exit and into the trees. The Giants" are the giant yellow and red tingle trees which are only found in this particular area of Walpole and Nornalup in the Walpole Wilderness Area. Yellow tingles are smaller, growing to thirty-five feet or more. The red tingles, however, reach almost eighty feet into the air! Walking in the shade of their great canopy is refreshing. The air is filled with a refreshing and cleansing forest-floor smell, and the silence under the canopy makes the Ancient Empires Walk, awe-inspiring. The trunks of these four-hundred year old trees are the broadest of all the Western Australian Trees, and grow to up to seventy metres high. The smaller sister to the giant reds, the non-buttressed bases look more like karri trees than the red tingle, and often grow within the tall karri forests, along valleys and dales. Some of these tingle trees are over fifteen metres round at the base, and getting the chance to get up-close to them is enchanting. A raised wooden boardwalk winds between and in some places even THROUGH the giant tingle trees. These split trunks are reminders of past bushfires (wildfires) which hollow out the bases. The trees continue growing through their outer rings! Some of these are large enough to use as shelter if it rained! "We had a wonderful time visiting the tingle trees at the Ancient Empires Walk. The boardwalk through the trees is excellently kept and well organised. Information signs throughout the Ancient Empires walk help you learn about nature as you stroll. Thanks for the Tip, Rainbow Coast." The red tingle trees of the Ancient Empire's Walk are a prime example of the South-West's forests which date from when the land here was attached to the supercontinent of Gondwana. The red tingle (eucalyptus jacksonii) has amazingly buttressed, knobbly bases in their trunks. Once you have completed the Treetop Walk you will be directed onwards to the Ancient Empires. The red tingle bark is a fascinating wavy ginger colour that reminds us of wavy ginger hair or the coat of a canine. The walk takes you beneath the ancient canopy on a meandering circular pathway back towards the Wilderness Discovery Centre. 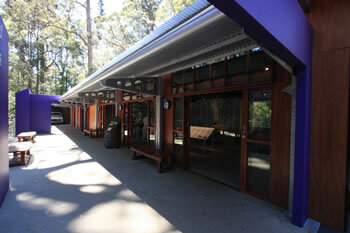 A visitors centre, gift shop and more are located at the centre. An entry fee applies to access the Treetop Walk and the Ancient Empires Walk. It is a pleasant and easy drive along the South Coast Highway from everywhere. Located in Denmark Shire, the Treetop Walk is actually closer to the town of Walpole. Find the Treetop Walk west of Denmark, East of Walpole. 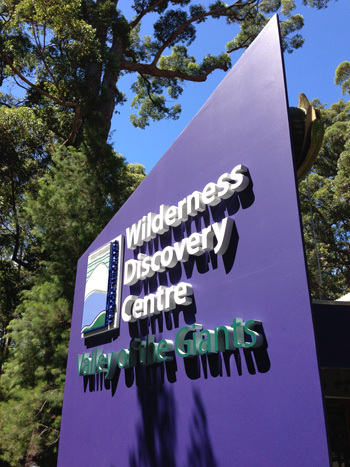 There is a beautiful Wilderness Discovery Centre at the Valley of the Giants with a gift shop and Visitors Information. If you like trees, you may want to continue your drive towards Walpole and visit THE Giant Tingle Tree. The Valley of The Giants is one of the most popular destinations for visitors to the region. From Walpole, travel 13 kilometres east along South Coast Highway, past Nornalup town site to Valley of Giants Road. If you are bringing a tour group or school group, please give advance notice of your proposed arrival time and approximate numbers by telephone on (08) 9840 8263 or visit the DEC website. Map of the Valley of the Giants Treetop Walk, the Ancient Empires Walk and the Wilderness Discovery Centre, Walpole, Western Australia. Tap the markers for information about the locations on the Map below.